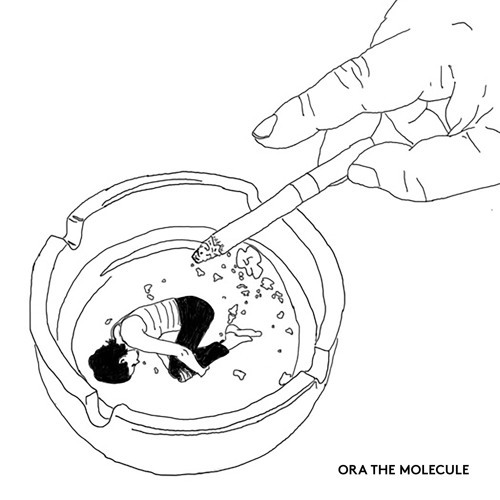 www.facebook.com/orathemolecule www.instagram.com/orathemolecule/ @orathemolecule www.orathemolecule.com Song written by: Nora Schjelderup + Jan Blumentrath Lyrics: SAMURAI Give back her time she has followed, now help her come back now Give back her time Her troubles are no longer with Give back her time Morning bath sun on her chin Give back her time She has aged but only her skin Hun så en annen vei Jeg tror hun så på deg Hun så en annen vei Jeg tror hun så på deg Give back her time She has followed, now help her come back now Give back her time Morning bath sun on her chin Love can’t lure her in There's a samurai living within Its grand fear could break through Her vision and her view And it will take it all But it can’t take it in It will grow high and fall Deep back into her skin The lyrics to ‘Samurai’ came as a spark from something I read in the NY times, It was an article showcasing drawings made from a woman imprisoned in Syria. She had portrayed her roommates in the prison, describing their characters and how the prison environment had affected their psyche over time. It made her think of the limited time we have in a life and how devastating it must be if it feels like your time has been taken away. It further made me think of the ‘biological clock’ that is often referred speaking of women, that they have some sort of less ‘time’ than men to do what they want before potentially establishing a family. The lyrics of the song is a blend of these reflections, a nostalgic throwback to what could have been, or was there but was taken away. Very cool sound and voice !